Dawn Grafe, Supervisory Park Ranger for the Oregon Coast National Wildlife Refuge Complex, has been selected as the 2010 Federal Land Manager of the Year for the U. S Fish and Wildlife Service. The award is given annually as part of the U.S. Department of the Interior, Take Pride in America program, a nationwide partnership authorized by Congress to promote the appreciation and stewardship of our nation’s public lands. 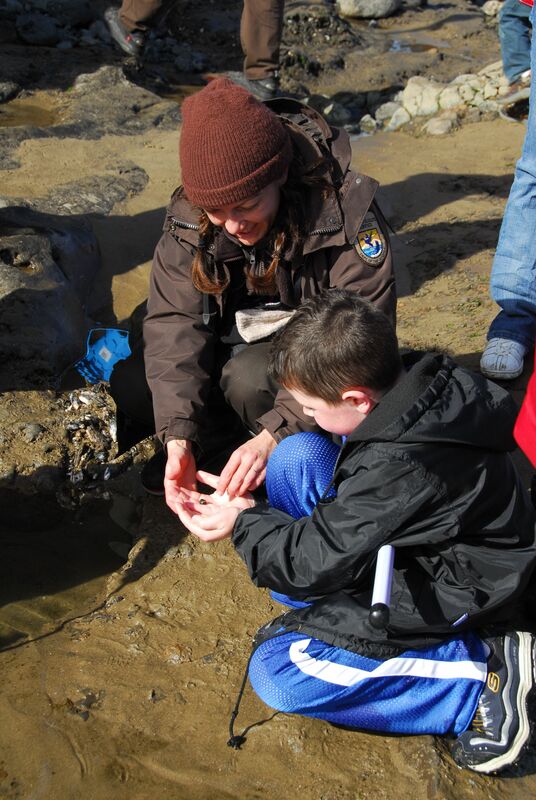 Grafe is responsible for overseeing outreach, recreation, environmental education and volunteer programs on Cape Meares, Nestucca Bay, Oregon Islands, Siletz Bay and Three Arch Rocks National Wildlife Refuges spanning 320 miles of the Oregon coast. She is being recognized for establishing a coastal volunteer program that is a model for outreach and interpretation on a large-scale. The Oregon Coast National Wildlife Refuge Complex (NWRC) combines spectacular scenery and wildlife viewing woven into one of the most popular tourist travel routes in the Western United States. This creates an ideal venue for developing volunteer interpretation and outreach programs adjacent to many overlook areas, roadside pull-offs, and beach trails. Grafe has led the effort to staff these sites with trained volunteers that educate the visiting public about the Fish and Wildlife Service, the Oregon Coast NWRC, local wildlife and habitats, and wildlife-specific issues unique to their assigned location. She also ensures that the volunteers are connected with other local contacts including State Parks staff and volunteers, Refuge Friends Groups, and City staff. In 2009 and 2010, Grafe worked with Oregon Department of Parks and Recreation to expand the refuge’s volunteer interpreter program to include additional interpretive sites and secure RV sites for resident volunteers. The Refuge now has volunteers at many of the major coastal overlook sites along the Oregon Coast and they stay comfortably nearby in their own RV’s at Cannon Beach, Cape Meares, Yaquina Head, Heceta Head, Simpson Reef ,Coquille Point, and Harris Beach. Grafe also helps coordinate local volunteers to control invasive plant species, maintain public use facilities and lead environmental education field trips. “Dawn is a talented, enthusiastic and dedicated person”, said Roy W. Lowe, Project Leader for the Oregon Coast Refuge Complex. “Since joining our staff in 2001, Dawn has built up fledgling public use and volunteer programs to levels that are now being recognized nationally, and her award is well deserved”, said Lowe. Grafe will receive her award during the Take Pride in America award ceremony in the main building of Department of the Interior in Washington, D.C. on July 16th. The U.S. Fish and Wildlife Service is the principal Federal agency responsible for conserving, protecting and enhancing fish, wildlife and plants and their habitats for the continuing benefit of the American people. The Service manages the 150-million-acre National Wildlife Refuge System, which encompasses 552 national wildlife refuges, thousands of small wetlands and other special management areas. It also operates 69 national fish hatcheries, 64 fishery resources offices and 81 ecological services field stations. The agency enforces federal wildlife laws, administers the Endangered Species Act, manages migratory bird populations, restores nationally significant fisheries, conserves and restores wildlife habitat such as wetlands, and helps foreign and Native American tribal governments with their conservation efforts. It also oversees the Federal Assistance program, which distributes hundreds of millions of dollars in excise taxes on fishing and hunting equipment to state fish and wildlife agencies.